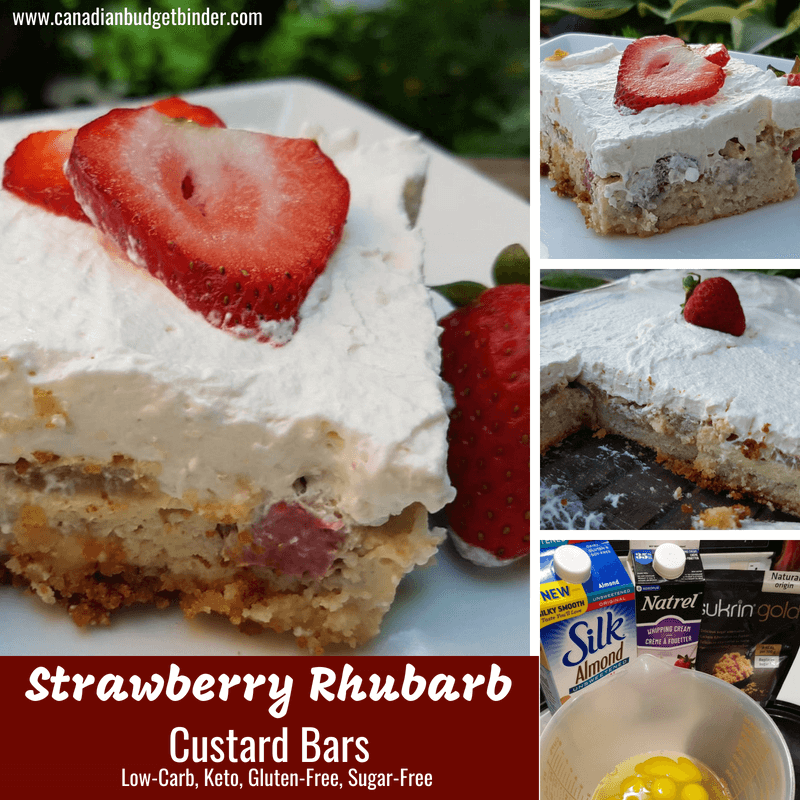 Some of the best rhubarb recipes start with your imagination and that’s what I did when Mrs. CBB and I created these easy Keto Strawberry rhubarb custard bars. These are going to be the bars you will want to make the next time you have a BBQ or potluck to go to or you are hosting a dinner party. If you are hosting a garden party or participating in one you can make these a couple of days in advance which is great news. No one likes to rush around the night before or the day of. Everyone who eats a sugar-free, gluten-free, low-carb, keto diet knows that having sweets once in a while is somewhat desired just like everyone else. The great part is with nuts and coconut you are able to create so many delicious low-carb recipes from cookies, loaf breads to pretzels and so on. Nuts are the perfect substitution for flour which is a gluten nightmare. With a huge patch of fresh, organic rhubarb growing in our back garden and a recent trip to the strawberry patch we had enough fruit to start baking and froze 2 large freezer bags full. We made some sugar-free strawberry chia jam and these lovely strawberry rhubarb custard bars along with copycat Starbucks strawberry acai pink drinks. Coming from the UK I swear custard was a part of our daily diet and something Mrs. CBB noticed. Yep, there are lots of custard desserts in the UK which is why my parents love Boston Cream donuts from Tim Hortons when they visit Canada. My mum and dad love custard and even when we returned to the UK last year she had at least a dozen custard cups prepared in the refrigerator at any given time. It’s just a British thing I guess. The great part about tradition is being able to blend flavours and textures to come up with new ideas which is what we did with this recipe. You will find the base of these strawberry rhubarb bars to be similar to that of the sugar-free caramel cheesecake we make as we tend to keep things simple. When creating the custard filling we wanted to make sure that we had enough eggs and cream to create a thick filling but added in some (we use this>>> xanthan gum to help this process along. Instead of straight whipping cream we cut it unsweetened almond milk which offered the custard light almond notes. If you prefer a tart custard square you can add less strawberry and more rhubarb or the other way around depending on your preference. We went for the balanced approach as we both like each fruit equally and think the flavours pair well especially with the notes of almond extract in the crust. For the topping we kept that simple as well with a simple whipped cream cheese topping that was fluffy and airy then added more slices of strawberry on top when served. 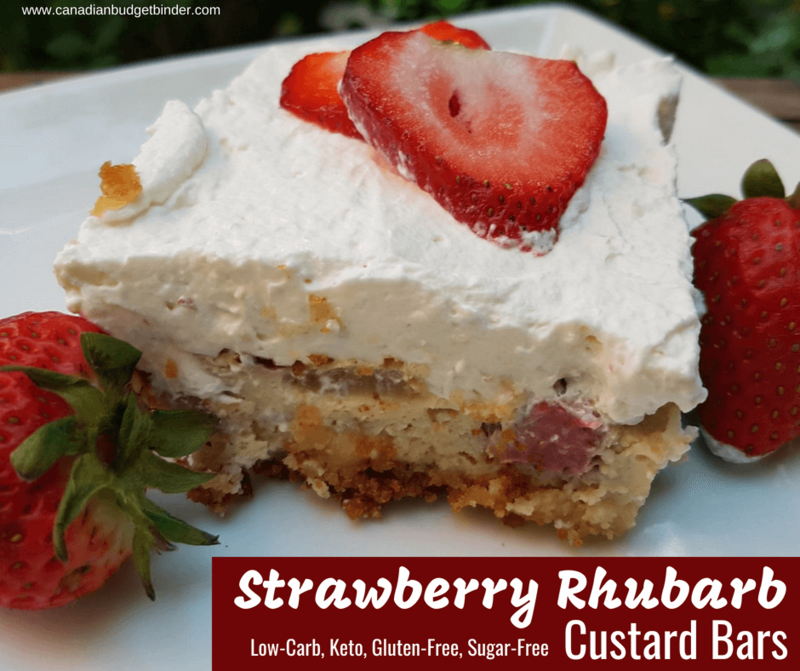 Serving these strawberry rhubarb custard bars cold is a must and you may find after a couple of days chilling in the refrigerator that they taste even better. This tends to happen with just about every keto dessert we create and we believe it has something to do with letting the flavours set. The same thing goes for cookies and puddings as well but you can eat these strawberry rhubarb custard bars as soon as they are chilled without issue. 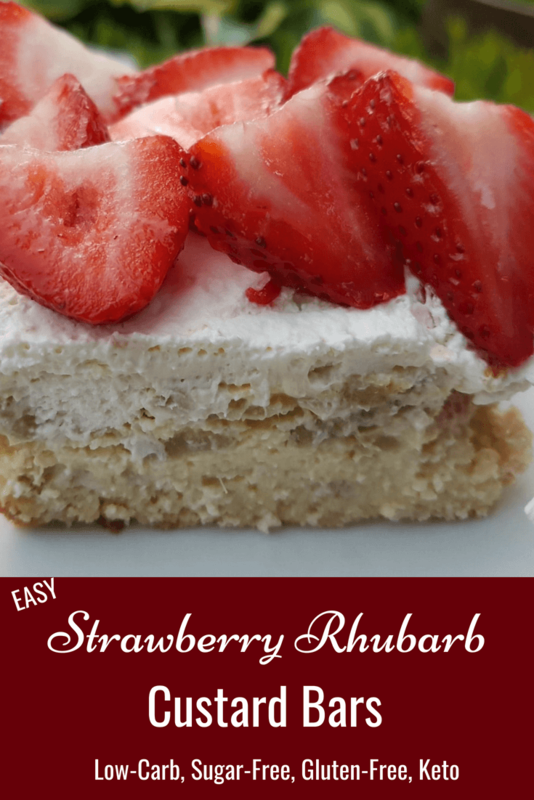 You will love how easy it is to make these Strawberry Rhubarb Bars! In a large bowl mix all the dry Almond Crust ingredients until combined then cut in the cold butter until the crust looks crumbly. For the filling add the eggs, xanthan gum, vanilla extract, Sukrin Gold brown sugar, heavy cream, almond milk, salt in a stand-mixer or bowl and mix to combine. Fold in the rhubarb and strawberries. Pour mixture over the cooled almond crust and bake for 35 to 45 minutes at 350 degrees until the custard sets. Remove from oven and cool completely. Add all of the topping ingredients to a stand mixer or bowl and cream together to form a fluffy topping. Spread evenly over top the custard squares. Cover and chill in the refrigerator. Cut into squares and serve. Top with extra strawberry or rhubarb slices for added appeal. Freeze for up to 2 months or refrigerate up to a week. I hope you enjoy this perfect party dessert and the next time you have a gathering to go to whip up a batch and I bet you that no one will know they are keto let alone gluten-free and sugar-free. Try it, you’ll see. You can freeze the strawberry rhubarb squares up to 2 months however they’ve never lasted longer than that in our house so they may keep far longer than that. If you refrigerate a week at the longest possibly 2. Discussion: What are some of your favourite fruit custard bars? Nutrition: 24 bars, 4 net carbs each bar, 15 grams fat. Note: With any keto recipe the Net carbs will vary depending on what app or online system you use. Enter your email address on the home page to SUBSCRIBE to my blog. Once you subscribe you’ll receive an email from me immediately. The reason is that you need to approve the subscription in order to start receiving my daily blog post. Note some links may be affiliate links where CBB gets a small payment if you make a purchase. This helps keep CBB running! Thanks.